A. CMA's 100% Man Safe Guillotine Goggle Gate - Submitted By: CMA engineering Inc.
B. METAL SHARK BIG PBA - Submitted By: Connexus Industries Inc.
D. AC Veneer Clipper-  Submitted By: Raute Canada Ltd.
E.  P2 Patching System - Submitted By: Raute Canada Ltd.
F. Dry Random Veneer Stacker - Submitted By: Raute Canada Ltd. Submitted By: CMA engineering Inc. Description: CMA Man Safe Guillotine Goggle Gate is engineered to deliver isolation of ductwork and other equipment in extremely harsh environments. It is available in 3 different mounting styles: vertical mount, horizontal mount, and side mount. It is designed in sizes of 36" up to 120". The Goggle Gate completely segregates hot dirty flue gases from adjacent equipment by means of a quick action upward goggle plate movement. The included booster fan provides a gas tight operation which ensures zero leaks within the system. 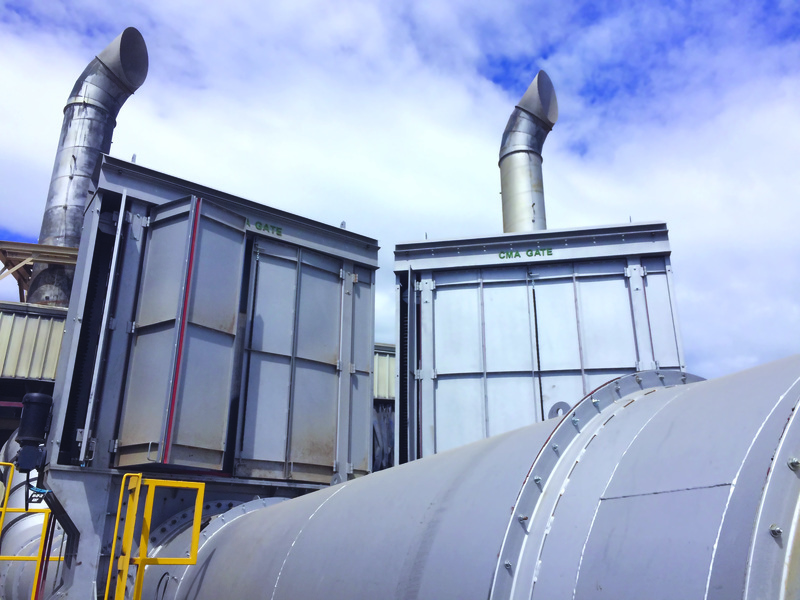 This gas tight operation enables the Goggle Gate to function repeatedly despite the probable settlement of solids at the bottom of the duct, which therefore eliminates the need for regular cleaning. Standard design provides a zero leak, 100% man safe solution for equipment isolation. Unique but simple proprietary design guarantees gate closure and provides for a cost-effective solution to equipment isolation. Furthermore, the 100% Man Safe Guillotine Goggle Gate functions with ease in hot dirty flue gases due to the distinct self-cleaning gate guides. The Goggle Gate is actuated by a standard Premium Efficiency electric motor which rotates the acme screws on both sides of the gate. The screw mechanisms are located in a clean environment, completely isolated from the ductwork, and are covered by removable guards which provide easy access for maintenance purposes. The 100% Man Safe Guillotine Goggle Gate is completely coated with high temperature aluminum paint. This delivers a rugged and durable finish that is sure to withstand industrial wear and tear. Benefit #2: Ability to perform in hot dirty flue gases. Measurable Results: Client Feedback - Functions as Advertised. Submitted By: Connexus Industries Inc. The Metal Shark BPA is a metal detector aperture designed to detect foreign metal objects in chip and fiber mats in forming lines. Highly sensitive detection coil. 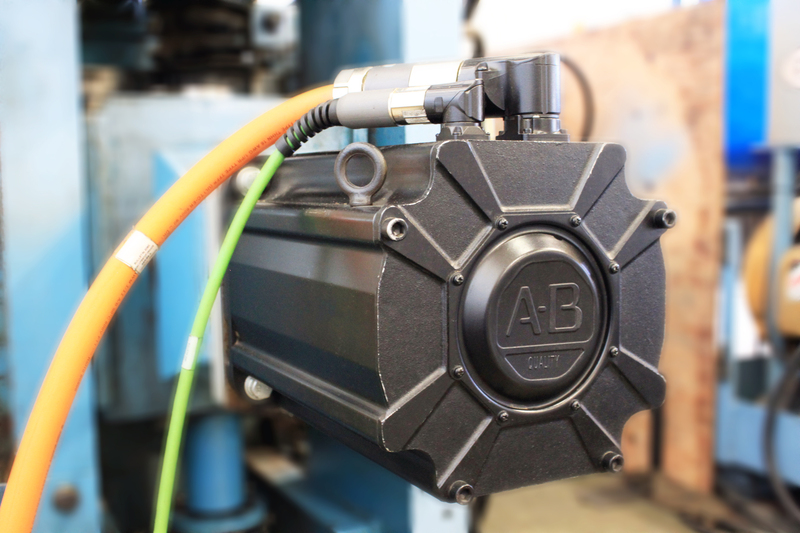 Power Drive Booster Field - Powerful measuring field in the detection coil enables the detection of metal to be carried out largely unaffected by electromagnetic interference. Dynamic digital interference filter with frequency spectrum- Electronics creates and maps a product signature signal. This enables the aperture to find contaminates regardless of material characteristics. Fully-automatic definition of parameters when changing board format. Reserves of sensitivity and functionality enable optimal metal detection even under harsh conditions. Can operate under conveyor speeds of 1-400 ft/min. Anti-radio kit - The results are no way affected by radiotelephones, whether they are being used in VHF or UHF Frequency. Benefit #1: Fully-automatic definition of parameters when changing board format. Benefit #2: Reserves of sensitivity and functionality enable optimal metal detection even under harsh conditions. Measurable Results: 1With 150MM opening height can detect 1mm sphere at center aperture. New IMEAS model EVOL combines many field-proven mechanical and control (electrical) enhancements into one machine with modern redesigned operator-side enclosure. 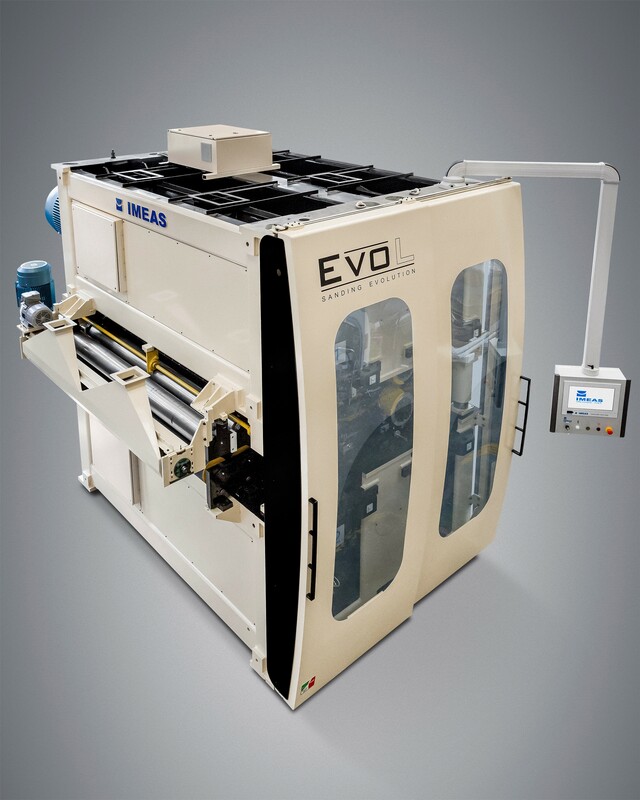 The new EVOL model represents IMEAS’ ninth generation of sanding machines. As the name suggests, it is the evolution of the company’s 50-years long experience and know-how in sanding of wood based panels. As a result, EVOL machines not only integrate state-of-the-art control technologies like our premium Full Control System TM and Full Control Belt TM, but also simplify maintenance by reducing the number of components and improving their accessibility in all-important areas. EVOL is a family of machines engineered to evolve continuously to face an ever-challenging business and as such they offer: Excellent calibration, superior sanded surface, cost savings, simplified operation and flexibility. Benefit #1: Improved sanding quality and throughput. Benefit #2: Automatic (recipe driven) sander set-up and closed-loop thickness control. Measurable Results: Increased throughput (at least 20%), and increased abrasive belt life (at least 10%). 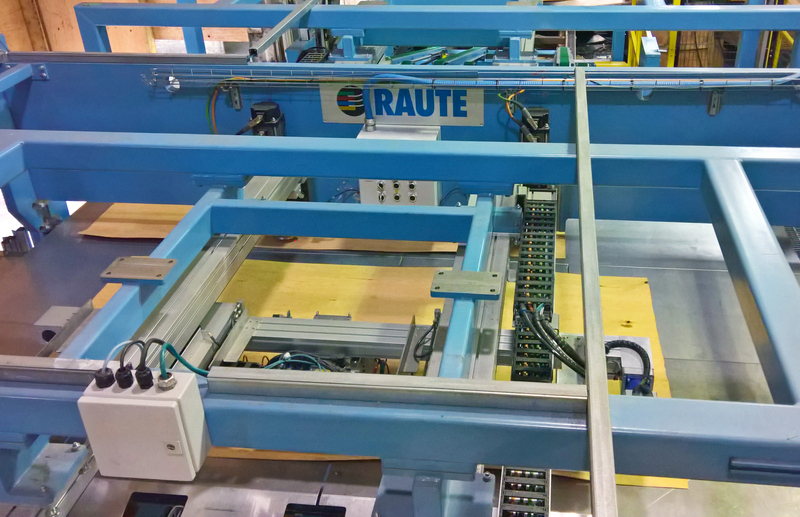 Submitted By: Raute Canada Ltd.
Raute's AC Veneer Clipper utilizes patent pending technology to deliver fast and accurate clips while significantly reducing overall operating costs. Raute raises the standard in green veneer clipping with the AC Veneer Clipper that utilizes advanced algorithms and proprietary technological innovations to increase clipping accuracy and recovery. Accurate execution and efficient operations save power and expensive consumables, which includes a substantial reduction in roll maintenance and replacement, decreasing costs as well as downtime. Benefit #1: Increased speed and clipping accuracy with roll speed matching for reduced rollwear and replacement. Benefit #2: Clip times of sub 45 millisecond and roll replacement only about once a year. The Raute P2 Patching System redefines veneer quality by transforming low graded veneer with minor defects into higher grades with speed, accuracy, and significantly lower operation costs. The P2 Patching System is the fastest patching line in the industry with up to 9600 patches per hour via 3 levels operated by only one operator. 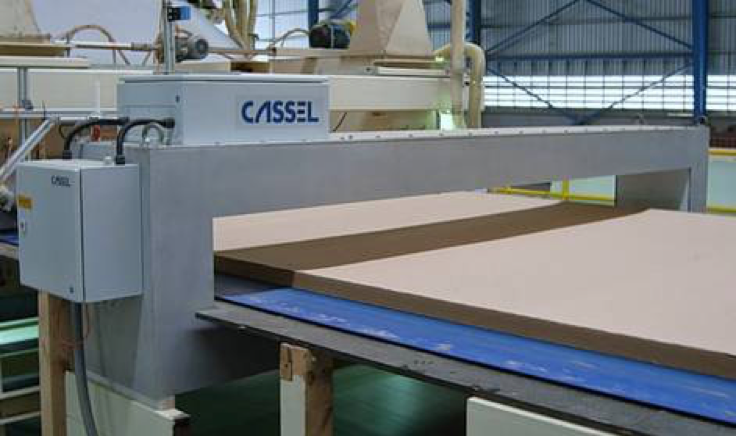 Sophisticated cameras and automated technologies minimize waste while maximizing surface veneer value without manual veneer handling on 1/4 of the manual patching floor space requirements. Benefit #1: Increased recovery - produces highest possible veneer grade. Benefit #2: 40% - 60% decreased operation costs. Submitted By: Raute Canada, Ltd. The Raute Dry Random Stacker has allowed improved grade sorting capacity, reduced personnel count and improved safety. 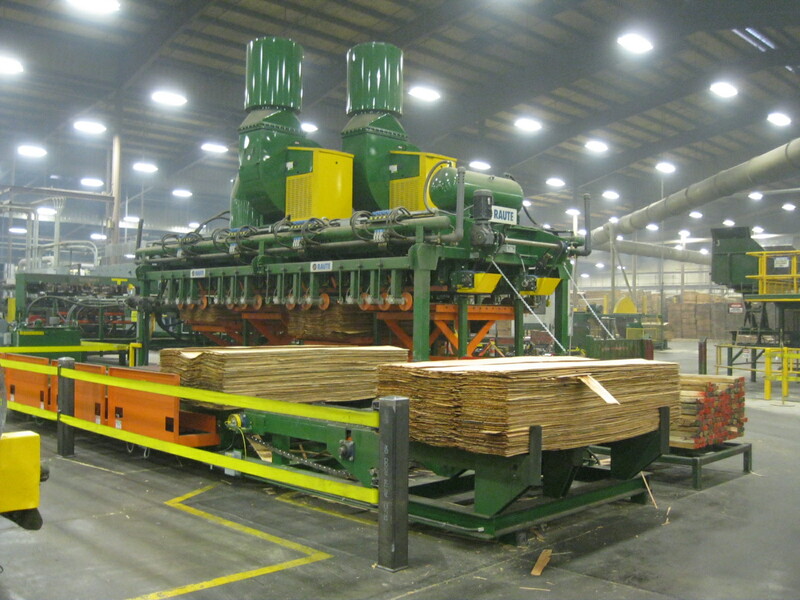 The Dry Random Stacker has eliminated the hazards to the employee from hand pulling dry random veneer, reduced staffing significantly and added high-grading veneer sorting capacity. The direct benefits include eliminations of injuries that historically occurred, a significant reduction in annual labor expenses and greatly improved veneer upgrade benefits. Benefit #1: Safety - elimination of recordables after installation. Benefit #2: Increases veneer grading and sorting capabilities, allowing up-value of premium veneers. Sweed’s new patent-pending “Smart Pause” technology provides veneer dryer infeed operators additional time to address veneer feeding issues while maintaining a 100% dryer fill rate. All this can be accomplished without stopping the dryer, thus maximizing production. Sweed’s “Smart-Pause” Infeed functions separately from the veneer dryer, utilizing the latest innovation in infeed programming and driving each deck independently. Smart Pause allows the operator to pause the feeder for up to 20 seconds upon a misfeed, without stopping the dryer. Once the misfeed is corrected, the “Smart Pause” infeed allows the veneer to “catch up,” and eliminates the gap created from the pause. Primary and Secondary Stop-Gates on each deck assures a veneer lap occurs prior to veneer entering the dryer. This technology virtually eliminates feeder misfeeds, and helps to improve veneer presentation to the dryer. Sweed’s “Smart-Pause” Dryer Infeed is a proven solution and increases overall dryer efficiency and production. It is simply, the highest-producing dryer infeed available in the industry today. Benefit #1: Ability to pause feeder (to fix veneer issues) without stopping dryer, and still maintain 100% fill rate. Benefit #2: Increases production by reducing misfeeds and improving veneer presentation to the dryer. Measurable Results: Reduction of Labor to only (1) operator. Up to 20 seconds allowable for handling misfeeds. Sweed's new Vacuum Feeder Peel Cups are an exclusive design, utilizing a patent-pending approach for gripping and feeding green veneer into the dryer. This method dramatically reduces feeding multiple veneer sheets, commonly known as “doubles.” It also reduces labor and allows for more consistent moisture content levels resulting in increased dryer efficiency. Traditional dryer feeders have vacuum cups that pick the veneer straight up while keeping the sheet flat. The downside of this design is the cup can inadvertently lift multiple sheets at one time, causing double feeds. When a double occurs, the operator must intervene and separate the sheets. With today’s dryer speeds and throughput requirements, this becomes a near impossible task, resulting in decreased productivity, efficiency, and out of spec veneer moisture levels. Sweed's new Peel Cups lift the sheet from the outside edges first, then pull it into the dryer tipple feeder. The Peel Cups' lifting process mimics an operator's efforts to separate two sheets from one another if they become stuck. The emulated process of the cup occurs mechanically, therefore not requiring assistance from the operator. This allows for faster feed speeds and reduced operator fatigue. Sweed’s new patent-pending Vacuum Feeder Peel Cups are a revolutionary design—made for today’s high-speed veneer dryers, for the highest performing dryer infeed in the world, Sweed. Benefit #2: Reduces labor & allows for more consistent moisture content levels resulting in increased dryer efficiency. Measurable Results: Reduces double-feeds by more than 70%. 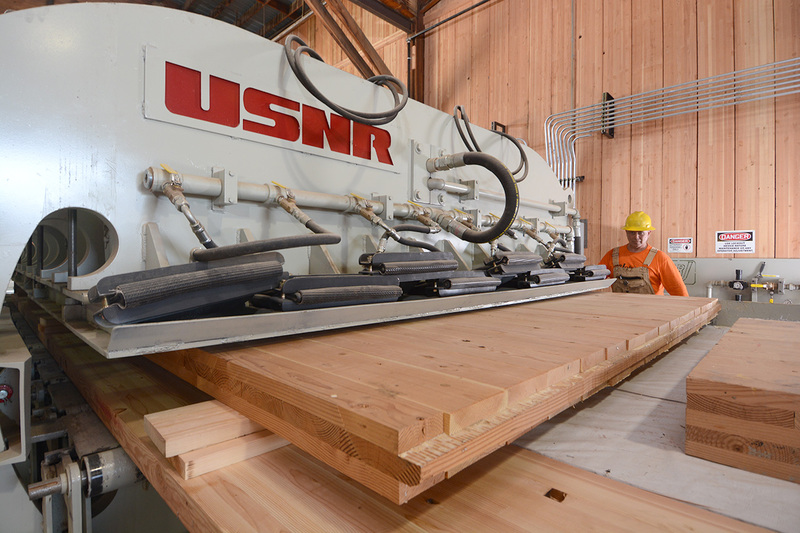 USNR’s new modular press for the manufacture of cross laminated timber panels features key design elements that make it a great choice for those entering the emerging North American CLT market. A key difference in USNR’s press is the use of compressed air instead of hydraulics. The panels are assembled using between three to seven layers of cross-laid timbers. Adhesive is applied between the layers prior to the panel entering the press. This press follows a “window frame” design consisting of 20 identical steel frames spaced 18” apart, with each frame having an opening (or “window”) which allows CLT panels to pass through the press. Once the panel has been fed into the press via a set of pop-up rolls, it comes to rest on platens within the press opening. A set of pneumatic cylinders then applies pressure from the sides to ensure minimal gaps between core materials within a given layer. Meanwhile, a set of channels carrying 8 large diameter pneumatic hoses is lowered to rest on top of the CLT panel. Once the panel is configured correctly within the window of the press, the 8 hoses are brought to pressure (typically to 100-150 psi). Press time depends largely on the time it takes to lay-up the panel, with a ratio of approximately 2.5:1 (press time to lay-up time). 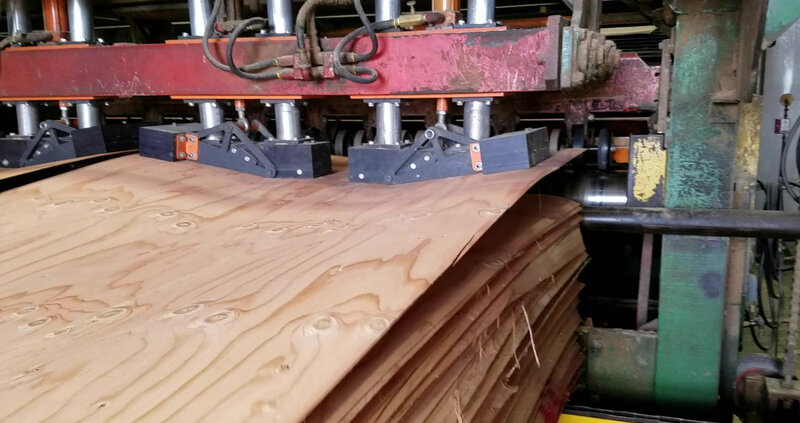 The unique curvature of USNR’s press opening allows it to redistribute the stresses and withstand the tremendous pressures required to produce APA-certified CLT panels. While most CLT presses utilize hydraulic cylinders to achieve the necessary pressures, the USNR press applies pressure pneumatically instead. This method is robust, extremely cost-effective, and more environmentally friendly than the hydraulic alternative. An additional advantage to the USNR design is its modularity – it can easily be modified to any desired length by simply adding or removing window frame segments. Benefit #1: Modular design can expand as the mill grows to accommodate market needs in cost effective way. Benefit #2: Uses compressed air instead of hydraulics for an enviro friendly design that reduces contaminants. Measurable Results: One customer has already expanded the length of their press as their CLT business has grown.